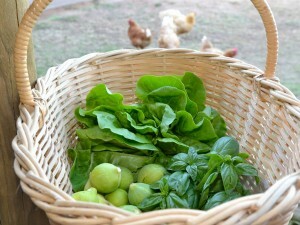 I was in the garden today as the sun was setting with my basket ready to collect supper! I was so surprised at how quickly I could have filled it! I have a head of butter lettuce, sweet garden peas and sweet basil. I also added a few figs because they are beautifully sweet and ripe and ready for jam. I made the most delicious jam last year which I will share with you and next time I come and visit, I will bring you a jar ot two of jam! 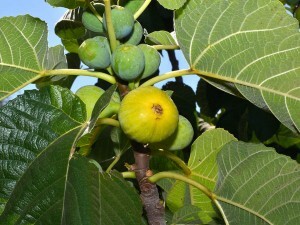 To prepare chopped figs: Cover figs with boiling water. Let stand 10 minutes. Drain, skin, stem and chop figs (I prefer it without the skin on, but the extra schlep is worth it). Combine figs, sugar and 1/4 cup of water in a large sauce pot. Bring slowly to a boil, stirring until sugar dissolves. Cook rapidly until thick (it took me 45min. I think the trick is to really let it boil until the desired thickness). Stir frequently to prevent sticking. Add lemon juice and cook 1 minute longer. Pour hot into hot, boiled jars, leaving a little head space. Adjust caps. Process 15 minutes on a boiling water bath. I got 4 jars of jam. I added less sugar than the recipe called for because I wanted the jam to taste natural, rather than sweet. I noticed that the figs were a bit spotty when I started. I understand that when the small spots form, as in bananas, the natural sugar in the fruit is changing and rising to the skin as the fruit ripens. As the figs cooked the sugar dissolved into the jam causing most of the spot to vanish. Love the basket of food – just look at that Basil! You know, the basil you brought me on Saturday – the smell of it is quite amazing! Unreal how great it smells. I loved the figs too – I’ve eaten them all already. Stef is going to use the Rosemary in meat balls later this week. I am SO inspired when I see your photos – I think I need to seriously consider changing that bed at the back into a complete veggie patch – its not attractive at the moment as it is and i think its an ideal spot. Will give it some thought this week and might have questions for you.